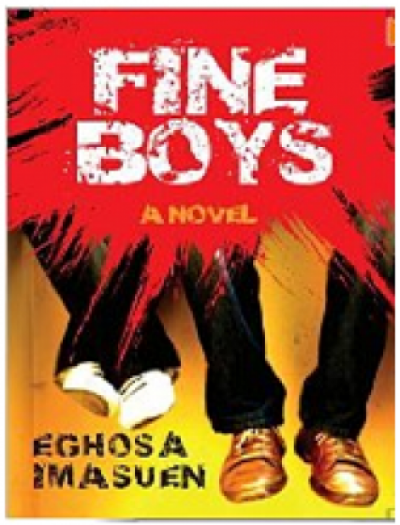 Fine Boys is a compelling story which nearly every undergraduate/graduate can readily identify with, a book which incites nostalgia for the “wonder years” of teenage frivolity and high jinks. Excerpt from Fine Boys by Eghosa Imasuen. I was escorting her to Osasogie gate on a dusty Saturday morning. Harmattan had come early this year and already the leaves were browning in the dust and dryness. A breeze caught her skirt and she let it twirl around her knees, dangerously close to indecently exposing her. Wilhelm had been away on one of his recent absences last night, absences that I was getting used to and had learnt not to pry into, even though they left a knot of concern in my belly. Amide had spent the night in my room and we were talking about the tests. She scored 59 percent in biochemistry and she had been gloating when I changed the subject. I bypassed the flat on the way back and took a shortcut to Fra and Preppa’s place. The walk took me through the hamlets behind Ugbowo. Children played in front of old-style Bini compounds, with the steeply sloping mud walls and central atrium and the ubiquitous hand painted signs, THIS HOUSE IS NOT FOR SALE. BY ORDER, FAMILY. Pant-wearing, snot-nosed kids danced around on dirt-floored chalk-drawn hopscotch rectangles while their mothers fried akara for sale. I stopped to buy some Akara under a sign, FULCANISA, REPARE YOUR TIRE HIA, and smiled to myself at the vocabulary—I would file it away for a joke, although I soon discarded it when I saw another that said, OGHENOVO THE CORFIN MAKER. AMBRANCE SERVICES ALSO AVALEBLE. I ignored the hand the woman used in serving me. I could have sworn that, as I came around the bend, I had seen her wipe her toddler’s bottom with it. I took the curve into Nova Hotel Road. Ejiro took his time. We sat on the waist-high fence in front of his new flat. He had taken over Kpobo’s room after the latter left for London. The rest of Ejiro’s new roommates played football on the grass and concrete lawn in front of us. Monkey post. Fra manned the goal and was sweating profusely, shouting and delivering tackles that would make an Italian cringe. The other players waxed and waned across the field, all in a crowd around the ball with no regard for positions or roles. Everyone apart from Fra was an attacker, then a defender, and then a midfielder. Preppa scored, his fourth for the morning, and we, the supporters, cheered. The clapping detail had a total population of two, Ejiro and me. We sat on the fence, occasionally cheered and played crosswords on the back of a newspaper. I nodded and murmured to myself that I did not. I lacked the attention span and always felt the puzzle designers were idiots. I did not tell Ejiro what I thought of those who had the time to solve the puzzles. I looked away from the paper and stared at the football game. I stopped seeing it and let my mind travel. It was November already. Just like in my case, the twins would not be entering school the year they were supposed to. The last time we spoke my brother had told me he wanted to leave Warri. He had taken over my job as purchasing clerk; the stress and the driving and Dad’s screaming were not the only reasons for wanting to escape. Eniye worked in the bank as an office clerk. She too had learnt how to drive and spent afternoons supervising Mom’s supermarket; the deal had been reached where she would work in both companies. They were both bored senseless. I wanted them to leave Warri too; Osaze would enter Uniben for engineering while Eniye had applied to study computer science at the University of Lagos. Mom and Dad’s truce had lasted only a month after Nene’s burial. The cold war quickly turned hot and most evenings at home began with us looking at an exasperated Dad pacing around the sitting room and a screeching Mom accusing him of every sin under the sun. She won the battle. She would begin law school in January. But the fights continued. After each, whether ending with blows or not, Mom would kneel in her room, from where we could hear her praying loudly for forgiveness. She typically stayed in there for hours, appeared to prepare food, eyes swollen and bloodshot, and quickly retreated into the room. Family dinners stopped and both of my parents took to eating in their rooms. Dad still called me into his to complain. I began to listen. I tried not to, and my heart broke, when Dad’s words made me ask my own questions. Why was Mom so angry? Why did she complain about having all her options taken away from her because of marriage and children? Were we a mistake? Would she have made professor if she had not had us? I was so happy when the General reopened the universities in late September. I noticed the envy on Osaze's face, in his voice, when he escorted me on the drive back to school.